I sadly received the news, Ed LaDou had passed away. (December, 27, 2007) There were many tributes and praises given to Ed. Each one, well deserved. Ed LaDou, was the pizzaiolo, who saw the endless possibilities of pizza. He took pizza to new levels of creativity. He was a true original. He is credited with creating the pizzas at Spago's, Wolfgang Puck's famous restaurant. "Wolf certainly gave Ed the toppings that he wanted, but it was Ed that ran that department single-handedly in the beginning," said Nancy Silverton, former pastry chef from Spago's. It is no secret, he created the entire menu for California Pizza Kitchen. Larry Flax, co-creator of CPK, explained: "We had Ed come in and work with us at the beginning of the restaurant." Not one to take a back seat, LaDou left CPK soon afterward, and created his own innovative restaurant, Caioti Pizza Cafe. He was able to feature his own pizzas in his own unique style. 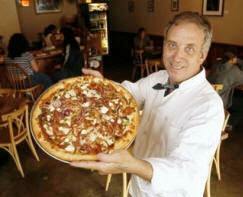 Adam Kuban, New York pizza blogger, created a fitting tribute to Ed, at Slice. I had shared a number of emails as well as conversations, with Ed. He was passionate, funny and a pizza master. He was very forthcoming about teaching others the craft of pizza making. He wanted to share his knowledge. He explained to me, last year, he was very ill. He didn't dwell on it, but he wanted to be honest about it. One of his highest honors came when he was asked to be a presenter of pizza, at the Smithsonian National Folk Life Festival. He was hailed as a National Treasure. "The Associated Press thinks maybe whoever has the best pizza, Chicago or Los Angeles, will determine who gets selected to host the 2016 Olympics. They picked Caioti Pizza Cafe to represent LA's best argument. A flattering selection for me, although one that might not be taken too seriously. : ) Just thought it was interesting and I'd pass it on to a few. Right up to the end of his life, Ed was celebrating pizza. A true master pizzaiolo who embodied the spirit of pizza. Regards to you, my friend. Thank you Ed for sharing part of who you are, with us. Our thoughts and well wishes go to Ed's family and friends.